The Blue Crane Combo Pack for the Nikon D300 Digital SLR Camera is a thorough overview of the camera. In both print and video, this package not only gives you something to watch at home, but an InBrief Quick Field Reference Guide that you can take in the field. On a job? Forget which button to press? Need to change a setting? The Reference Guide will have the answer for you in a flash. It's faster and easier than carrying the manufacturer's instruction manual. 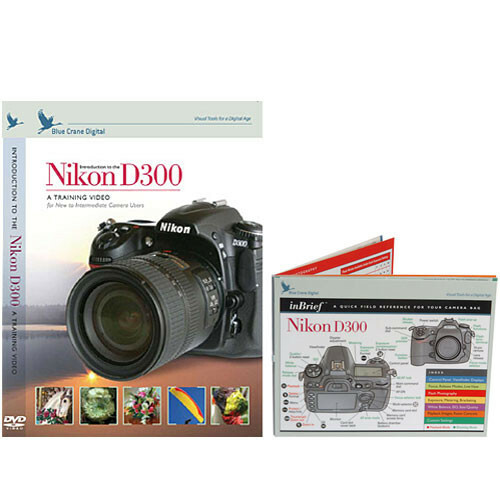 Box Dimensions (LxWxH) 7.9 x 6.6 x 0.9"
DVD and Guide: Combo Pack for the Nikon D300 Digital SLR Camera is rated 3.0 out of 5 by 2. Rated 2 out of 5 by Anonymous from Not worth it! This DVD is all right if you are beginner and do not know a whole a lot picture taking. This DVD covers more of the basics of taking pictures, then the camera opertion. I bought it to help me with the D300 controls and all the little things about the camera. It did not cover enough of the camera for me.